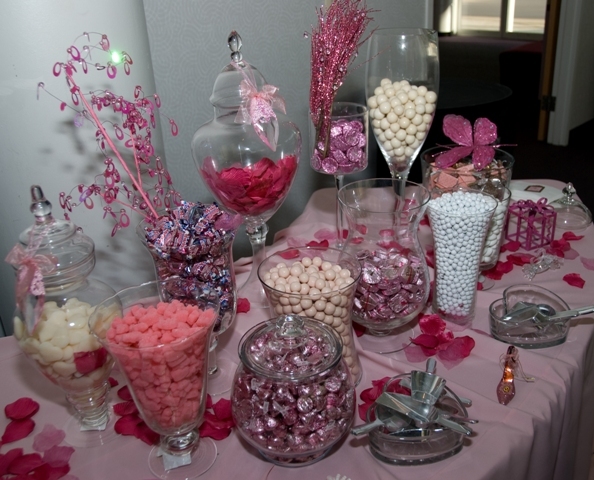 Indulge your guests’ sweet tooth with a candy buffet. Not only are they delightful edible treats, they can also serve as favors as much as party decoration. When we think candies, we think kids or casual or fun. 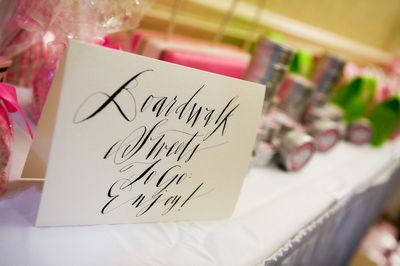 But nowadays, more formal gatherings such as weddings feature candy buffets as well. Thanks to Martha Stewart Magazine. 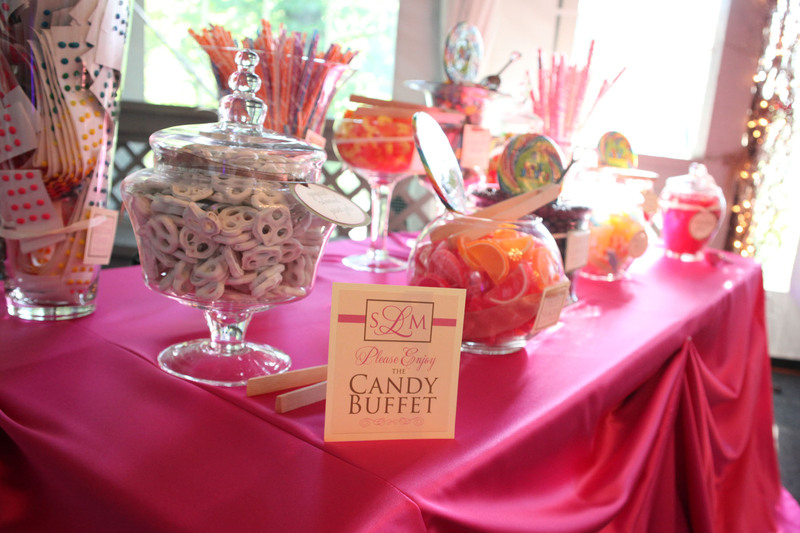 Candy buffets can look anything from colorful and fun to elegant and chic. 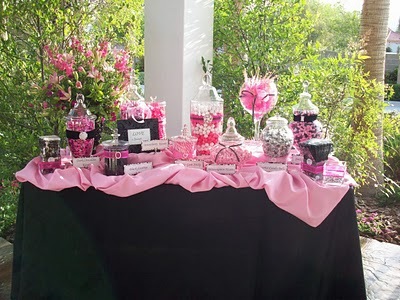 Your wedding venue/location, season, time, wedding motif can play a part in deciding how your candy buffet will look (i.e. candy colors). 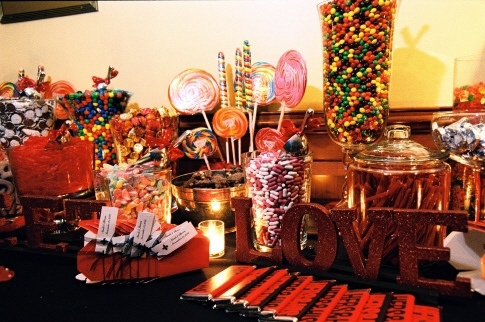 Don’t forget to include the candy buffet in your budget if you’re planning to have one. 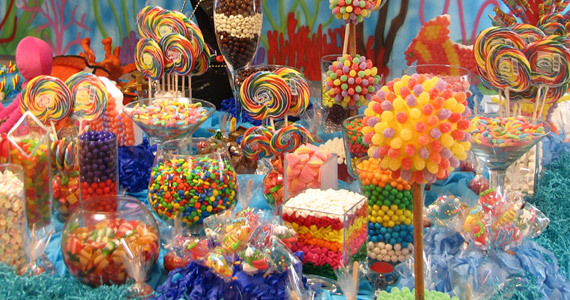 Cost of materials can add up quickly and your candy buffet can cost more than you expected. One of the most common advice for doing candy buffets is to not skimp. It is very possible for a candy buffet to look bare and pitiful when done on a budget. Depending on the number of guests and containers (full containers make pretty candy buffets), set aside about $200 to $500 or even more. You can use bowls, vases, jars, apothecary jars or similar containers for your candy buffet. Feel free to use different sizes and types of containers. You can be creative and use unique and cool containers. Clear/glass containers are best. They showcase your candies and guests can easily see the candies available. If you prefer opaque containers, go for low and open. If possible, use containers with bigger openings so the scoops/tongs can fit and be easily taken out when full of candy. Large or tall vases may look attractive when added in to your candy buffet, but remember that scoops/tongs may not be able to reach the bottom. You can fill the bottom with fillers like colored tissue and fill the top with candy. You don’t have to buy big or tall containers to add height to your candy buffet. You can use a stand, platform or overturned vases/containers to elevate some of the containers. The number of containers you need may depend on the size of your table. A ‘full’ candy buffet table looks a lot nicer. If the table is too big, you can fill it with other items like flowers, linens, frames, paper lanterns to make it full. You can use scoops or tongs or both. There are different types available (i.e. silver, clear, wood) that you can use to match the feel of your wedding if you like. Candy buffet containers don’t have to be expensive. You can use bowls and vases that you already have at home. You can also ask friends if they can lend you some. Visit thrift shops and flea markets for cheap finds. Though some suggest around 5-8 ounces of candy each guest, this may not be preferable. Containers that are not filled may not look pretty. You can either buy more candy to fill big containers or buy other fillers such as colored tissues or such. It is suggested to have 8 to 10 candy varieties and about 15 to 20 pounds each. When choosing the types of candies to use, take into consideration your venue and season. You may not want to have chocolates when it’s too hot. You can save on candy when shopping right after holidays such as Easter and Halloween. You can also buy candy in bulk. Decide what guests will use to put their treats in. If needed, don’t forget to provide seals or adhesive labels to seal the packaging. You can be creative as much as you like. This is one element in the candy buffet you can personalize (i.e. stamp your names or logo on the packaging, monogram seals). If you’re on a budget, you can control the amount of treats each guest gets by the size of the packaging you provide. Serving you a little treat just to say we think you’re sweet. Love is sweet, enjoy a treat. Thank you for making our day sweet. Help yourself to a tasty treat, and remember, love is sweet. Get a bag, fill it up, and enjoy! Love! Love! Love! Candy buffets 🙂 – Sinfully Sweet! When picking the style of the custom wedding invitation you need to maintain the kind of wedding which you are getting in thoughts. If you are having an outdoor wedding or a themed wedding you might wish to incorporate the same theme into the custom wedding invitation. It draws attention to the style of the wedding and can really help the guests know how you can dress for your special day. Many brides have decided that they should include extra things within the invitations like pictures, poems or other saying that makes the invitation distinctive.